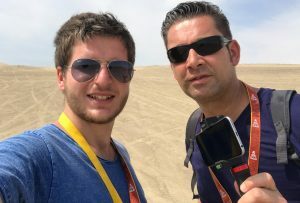 Reporting on the toughest rally in the world and making a documentary about it—is that possible when using only a phone and a few accessories? Yes, of course, it is. This is our story. 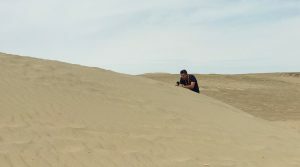 My colleague Ronald (right) and I (left) in the Peruvian dunes. 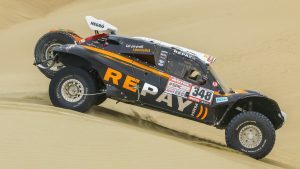 The Dakar Rally takes place in South America. 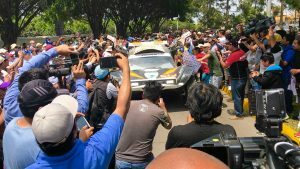 This year’s edition started in Peru (with plenty of dunes), crossed Bolivia (at a very high altitude, 4000+ meters), and finished in Argentina (with very high temperatures). My colleague Ronald and I followed one competitor in particular: Ebert Dollevoet, who was competing in Dakar for the 10th time but had never reached the finish. We made a daily report (video diary, vlog, you name it) of his experiences for our website and social media. The footage that we shot for those reports has been compiled into a documentary. Unfortunately, Ebert Dollevoet had to withdraw from the rally after a couple of days (so even in this last attempt again, he didn’t reach the finish). Apart from Dollevoet, we also covered the performance of the other competitors from our region. Why did we choose to shoot with our phones? In this project, two of the primary advantages of shooting with a smartphone came together beautifully. Speed. When something happened in the rally, we wanted to report it immediately. Speed was very important to that end, because of the time difference and competition. 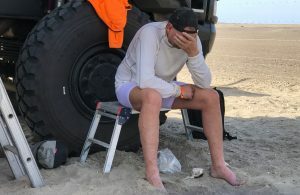 When the competitors finished the day’s stage, it was late in the evening in the Netherlands already. So, the faster we published our content, the more chance we had for people actually watching it. Our main competitor was a national broadcaster, which has the rights to air all the footage from the rally itself. They had to transfer everything via satellite (and that was only possible in certain time slots). Just because we shot with our phones (and edited on our phones, and uploaded from our phones), we were faster than them at all times. Getting close. For the reports and the documentary on Ebert Dollevoet, we wanted to get as close to his team as possible. In certain situations, we wanted to act as a fly-on-the-wall. The mechanics didn’t have any camera experience, so it was a huge advantage for us that we didn’t have to intimidate them with a large camera. We used an iPhone 7 Plus (with a local sim card) as the main camera and an iPhone 6 (with a local sim) as a second camera. We also carried another iPhone 6 (with a Dutch sim card). On most occasions, we worked together, so one of us acted as the cameraman, while the other functioned as the reporter. We used an iRig Mic HD2 as our main microphone (and when that became defective, we used an original iRig Mic HD). Also, we made use of iRig Mic Lav lavalier microphones and a Sennheiser EW100 wireless lavalier microphone. As a phone grip, we used the Sevenoak PSC-1 with an extension grip. We also used a Beastgrip with Kenko 0.75x wide-angle lens. Our main light was a Manfrotto Spectra 2. But, as it didn’t function well, we switched to a Menik STL-9. We recorded everything in Filmic Pro and edited the daily reports in LumaFusion. We had created a couple of templates in LumaFusion before, so we could make use of some design elements without spending too much time on editing the videos. To transfer the footage to our broadcaster’s FTP server, we used FTPManager Pro and an FTP app that I’m developing myself (which will be available soon; beta testers are welcome!). Thousands of people at the start in Lima. We tried to backup the footage that we shot every day via a MacBook on two external hard disks. Regular backup was necessary to ensure that we had enough free space on our phones. We chose to use two hard disks, so that we wouldn’t have a problem if one of them would fail. The only non-mojo part was editing the documentary. We did that on an old-school computer in our broadcaster’s office, in an old-school desktop video editor (Avid). This made sense, as our broadcaster has a few nice edit suites that run on Avid, and for a long-form edit such as this project, it’s nice to work on a couple of big screens instead of an iPhone/iPad. But, of course, this could have been done in LumaFusion as well, there’s no doubt about that. For the tenth time, Ebert Dollevoet didn’t reach the finish line. Our biggest challenge was finding a reliable connection every day. Luckily, in most bivouacs, 4G coverage was available for some carriers. The first thing that we did after crossing a border was buying a local sim card with an activated 4G connection. Theoretically, this should be easy, but we faced quite a bit of trouble in every country (sim cards sold out, activation only possible with a local passport, etc.). After arriving in a bivouac, the first thing we did was checking the 4G connection. When that connection turned out to be rubbish, we had to use the Wi-Fi connection of a hotel or people living nearby. On some days, no cell coverage was available at all, so we had to drive out to a nearby city that had coverage. Filming in very bright light (in the desert, in the middle of the day) is also a challenge. When you can see almost nothing on your phone’s screen, due to the sun’s glare, it’s hard to determine whether your interviewee is in focus or not. We made one big mistake. We brought a VJ camera with us as a backup camera, or for possible scenarios when we would require a ‘real’ camera for whatever reason. We didn’t take it out of its bag even once. It took up a lot of room and weight for nothing. When filming in challenging circumstances like this, your gear will fail sometimes. We tried to make sure that we had a fallback option available for as many gear as possible. So, the day our handheld microphone stopped working (and our second handheld mic was in the hotel room), we could use a lavalier mic instead. It’s the same story when our LED light started malfunctioning. So, ensure that you have fallback options available for all your gear at all times! You can find all the daily reports that we made about Ebert Dollevoet in this Storify. All members of this team are firemen. The town of Boekel is very small (1000 inhabitants), but six of those people from Boekel are in the Dakar Rally. Father and son, together in one team. You can find all the videos we made and the articles we wrote at www.omroepbrabant.nl/dakar.